From 'prince charming' to becoming the king of Bhutan, the sudden transition to monarchy of 26-year-old Oxford- educated Jigme Khesar Namgyel Wangchuck has left the tiny Himalayan kingdom stunned. The Chief Justice of India, Mr Justice Y.K. Sabharwal, today asserted that there was no question of any confrontation between the Judiciary and the Legislature. Tightening the law on defection, particularly in case of independent legislators who often change loyalty, the Supreme Court has ruled that an independent member first has to shed his ‘independent character’ to escape disqualification if he joins a political party. The US embassy has opened visa appointments in Delhi, Mumbai and Chennai for all categories of non-immigrant visas. This flexible approach gives applicants the option of visiting any of these consulates. Defence Minister A.K. Antony today said there were no “agenda” for expanding the Indo-US defence ties from the present joint exercise level despite strong suggestions for the same from Washington. Three service chiefs, Gen J.J. Singh, Admiral Sureesh Mehta and Air Chief S.P. 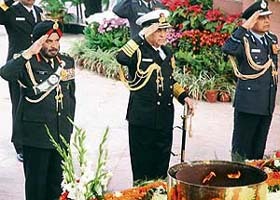 Tyagi, at the Vijay Divas wreath-laying ceremony to commemorate the sacrifice of martyrs in New Delhi on Saturday. Prime Minister Manmohan Singh has mourned the demise of Rajya Sabha member Sukhbans Kaur Bhinder. Mrs Bhinder who breathed her last at Sir Ganga Ram Hospital on Friday, was cremated at the Lodhi crematorium here today. British government’s plans to bring a new immigration law to prevent religious leaders with little knowledge of English or the west to come and teach in Britain may adversely affect the Sikh community here. “You can call it witch-hunt, you can call it conspiracy. 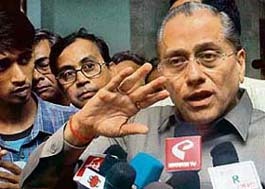 I have become a victim of it,” Jagmohan Dalmiya said after he was expelled from the BCCI for financial irregularities during his tenure. He vowed to challenge the life ban in a court of law. The Delhi High Court on Monday will pronounce its verdict in the Jessica Lall murder case on the appeal filed by the Delhi Police challenging the acquittal of all nine persons, including prime accused Sidharth Vashisht alias Manu Sharma by the trial court. The Supreme Court has cautioned against permitting unregulated genetic field trials on various crops and told the government that it should take into account the opinion by experts against such trials having far-reaching consequences. After crores literally flowing down the drain through ambitious river-saving projects like the Ganga and Yamuna action plans, the government is planning to take control of five major rivers, which hold immense spiritual, emotional and religious significance for the people of the country, and declare those as national heritage.